Then arose Peter, and ran unto the sepulchre; and stooping down, he beheld the linen clothes laid by themselves, and departed, wondering in himself at that which was come to pass. And, behold, two of them went that same day to a village called Emmaus, which was from Jerusalem about threescore furlongs. And they talked together of all these things which had happened. And it came to pass, that, while they communed together and reasoned, Jesus himself drew near, and went with them. But their eyes were holden that they should not know him. And he said unto them, What manner of communications are these that ye have one to another, as ye walk, and are sad? And the one of them, whose name was Cleopas, answering said unto him, Art thou only a stranger in Jerusalem, and hast not known the things which are come to pass there in these days? And he said unto them, What things? And they said unto him, Concerning Jesus of Nazareth, which was a prophet mighty in deed and word before God and all the people: And how the chief priests and our rulers delivered him to be condemned to death, and have crucified him. But we trusted that it had been he which should have redeemed Israel: and beside all this, to day is the third day since these things were done. Yea, and certain women also of our company made us astonished, which were early at the sepulchre; And when they found not his body, they came, saying, that they had also seen a vision of angels, which said that he was alive. And certain of them which were with us went to the sepulchre, and found it even so as the women had said: but him they saw not. Then he said unto them, O fools, and slow of heart to believe all that the prophets have spoken: Ought not Christ to have suffered these things, and to enter into his glory? And beginning at Moses and all the prophets, he expounded unto them in all the scriptures the things concerning himself. And they drew nigh unto the village, whither they went: and he made as though he would have gone further. But they constrained him, saying, Abide with us: for it is toward evening, and the day is far spent. And he went in to tarry with them. And it came to pass, as he sat at meat with them, he took bread, and blessed it, and brake, and gave to them. And their eyes were opened, and they knew him; and he vanished out of their sight. And they said one to another, Did not our heart burn within us, while he talked with us by the way, and while he opened to us the scriptures? And they rose up the same hour, and returned to Jerusalem, and found the eleven gathered together, and them that were with them, Saying, The Lord is risen indeed, and hath appeared to Simon. And they told what things were done in the way, and how he was known of them in breaking of bread. When Christ, who is our life, shall appear, then shall ye also appear with him in glory. Mortify therefore your members which are upon the earth; fornication, uncleanness, inordinate affection, evil concupiscence, and covetousness, which is idolatry: For which things' sake the wrath of God cometh on the children of disobedience: In the which ye also walked some time, when ye lived in them. But now ye also put off all these; anger, wrath, malice, blasphemy, filthy communication out of your mouth. Lie not one to another, seeing that ye have put off the old man with his deeds; And have put on the new man, which is renewed in knowledge after the image of him that created him: Where there is neither Greek nor Jew, circumcision nor uncircumcision, Barbarian, Scythian, bond nor free: but Christ is all, and in all. Then said He unto him, A certain man made a great supper, and bade many: And sent his servant at supper time to say to them that were bidden, Come; for all things are now ready. And they all with one consent began to make excuse. The first said unto him, I have bought a piece of ground, and I must needs go and see it: I pray thee have me excused. And another said, I have bought five yoke of oxen, and I go to prove them: I pray thee have me excused. And another said, I have married a wife, and therefore I cannot come. So that servant came, and shewed his lord these things. Then the master of the house being angry said to his servant, Go out quickly into the streets and lanes of the city, and bring in hither the poor, and the maimed, and the halt, and the blind. And the servant said, Lord, it is done as thou hast commanded, and yet there is room. And the lord said unto the servant, Go out into the highways and hedges, and compel them to come in, that my house may be filled. For I say unto you, That none of those men which were bidden shall taste of my supper. St. Herman was born in the town of Serpukhov in the Moscow Diocese around 1756. At the age of 16, he entered the monastic life at the Trinity-St. Sergius Hermitage near St. Petersburg. While here he developed a severe throat infection from which he nearly died. After fervent prayer before an ikon of the Theotokos, he fell into a deep sleep. During this sleep, He dreamed that he was healed by the Virgin and upon waking, he had completely recovered. A few years later he moved to the Valaam Monastery on Lake Ladoga. While at Valaam, he was under the spiritual guidance of the Elder Nazary who had played a significant role in the revitalization of Spiritual life in Russia after the decline of spirituality which resulted from the interference in Church life on the part of Peter the great and Catherine the great. At this time Gregory Shelikov, head of the Golikov-Shelikov Company - licensed to exploit the resources of Alaska - visited Valaam and requested monks to work in a new Alaskan mission. Father Herman was among the eight monks selected. The monks arrived on Kodiak Island on September 24, 1794, and immediately set out on the task of educating and converting the natives. Eventually only Fr. Herman survived from this original mission. The members of the mission felt that it was their duty to protect the Alaskans from harm and exploitation. Thy defended them against the often cruel treatment of the Russian-American Company which controlled the colony under the leadership of Alexander Baranov. As a result of their protests, and because they tried to place the natives under imperial protection by administering an oath of allegiance to the Czar to them, Baranov threatened the monks with physical violence and even placed them under house arrest. Sometime between 1808 and 1818, Fr. Herman went to Spruce Island, which he called "New Valaam". He spent the rest of his life on the island, where he cared for orphans, ran a school and continued his missionary work. 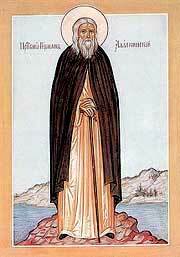 He lived the ascetic life of Orthodox Monasticism which has been standard since the time of the desert fathers. He built a small chapel, school and guest house. Food for himself and the orphans was produced from his own experimental garden. He wore the simplest clothing and cell was practically empty. His life was devoted to prayer and to following the services he could do as a simple monk who had not been ordained. The natives reported hearing choirs of angels chanting with him. His love for the native peoples grew continually. His greatest pleasure was being with the children under his care. When a ship from the United States brought an epidemic to the Alaskans, he remained with those stricken with disease constantly comforting the dying and praying with them. His love grew to the point that he could see into the hearts of his spiritual children and help them. The natives regarded him as their intercessor before God. When there was a tidal wave on the Island, Fr. Herman took an ikon of the Theotokos, place it on the beach and assured the people that the water would not rise beyond the place where the ikon was, and it did not. When there was a great fire on the island, he dug a trench and stayed the flames. Prior to his death he foretold that there would be no priest to bury him and that he would be forgotten for 30 years. He died on December 12, 1837. At the time of his death a pillar of light was seen above his cell.